→Vortex AMG UH 1 Review – A Holographic Wonder! 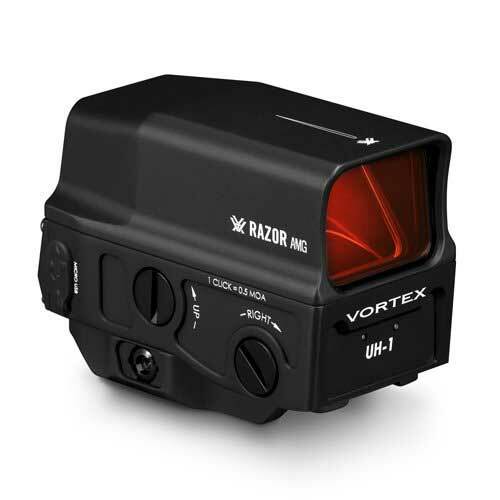 It is not often when you see a holographic sight that is as good as the Vortex AMG UH-1, not only because it offers outstanding quality when it comes to optical features, but also because it allows users to adjust the scope almost to the maximum available. This means that you get an attractive design in vision with holograms with the same quality of the red-dot, and the great accuracy of the best and most accurate of scopes, while allowing even more adjustments and changes that fit any application. Having a holographic element doesn’t mean you will get superpowers when shooting or aim at an exceptional precision only this system allows. No, but it will undoubtedly improve several factors that could make you shoot much better. For example, the sharp reticle alongside the zero-distortion holographic system makes the scope a lot more reliable, mainly thanks to its 15 brightness levels that you can adjust according to your needs. Then you have the unlimited eye relief and the total parallax free design, so you can aim faster and forget about imprecise shooting. Of course, all of this taking into consideration the glare-free and distortion-free performance only the holographic system can provide. Not only you can use the holographic system in 15 different levels of brightness, or get distortionand parallax-free performance, you will also be able to get the most from your battery and at the same time receive a fully light-oriented design so you can use it practically anywhere. Being a short to mid-range scope, there’s nothing more important than having the ability to use it for hours without problems. Also, you would like something that helps you aim more efficiently and at the same time more precisely. And that’s what this holographic system provides. Both with the light-emission eliminator and the EBR-CQB reticle, you obtain the ability to get a multi-purpose performance in almost every situation. Entirely efficient of the first moment you use it, the AMG UH-1 is a holographic wonder, which even if you haven’t used a similar scope before, it will make you feel incredibly familiar with its quality. Apart from offering a shock-proof and waterproof construction, the AMG UH-1 also provides the change to get even more protection thanks to the ArmorTek feature. This feature composes one of the most durable & resistant builds in the market, making the holographic system quality to be protected by a hard-anodized and top-notch construction that avoids scratches, water, oil, dirt, debris and much more. You immediately get an all-terrain & multi-purpose holographic scope that you can take practically anywhere without fearing breakage. The rugged construction with the ArmorTek finish makes one of the most reliable builds when it comes to scopes, especially holographic ones. What makes the design of the Vortex AMG UH-1 so versatile is the different mounting style it comes with. You will get both Weaver and Picatinny style bases to work with the AMG UH-1, whether it is one rifle, bolt, or even sub-machine guns or large pistols. No matter where you use it, the design is so versatile that you won’t have to worry about getting an additional scope or having to adjust too many factors before using it. It’s about fitting it on the desired gun,and that’s it. And of course, you also get exceptional adjustments, from windage & elevation up to a very convenient reticle that fits any application needs. Whatever option you choose to use for the AMG UH-1 will work splendidly well. However, each one of the following batteries provides a slightly different experience. The CR123A is the standard battery that comes with the scope and works excellently well as long as you maintain it off when not using it and know that it is not a battery that can last a lifetime. The LFP123A is a different type of CR123A, the same battery overall, the same power, strength, and reliability, but with an additional feature: it is rechargeable. Now being rechargeable means that you will get the same advantages you get from using a standard CR123A, but now you can use it almost at all times. And you can recharge it directly from the scope of the USB connection. Finally, you have the RCR123A, maybe the less likely to offer excellent performance and perhaps the most uncomfortable to use. However, it is also rechargeable and slightly convenient when it comes to power capacity. Yet, it may harm the functionality and operation of the AMG UH-1, as it doesn’t fit entirely. But it could be a decent replacement option. Although the holographic system of the AMG UH-1 was explicitly designed to provide much better brightness and optics during a wide array of situations, the performance of the reticle & visibility during day operations wasn’t the best. Using it on a sunny day on the outside can be incredibly annoying for those who want clear vision. The sunniest the environment, the harder it will be for you see through. However, during darker scenarios and at night, the performance of the AMG UH-1 is easily the best. But I you intend on using it during extremely light days, the result won’t be the most appreciable. Does the Vortex AMG UH-1 Offer an Earnest Performance? 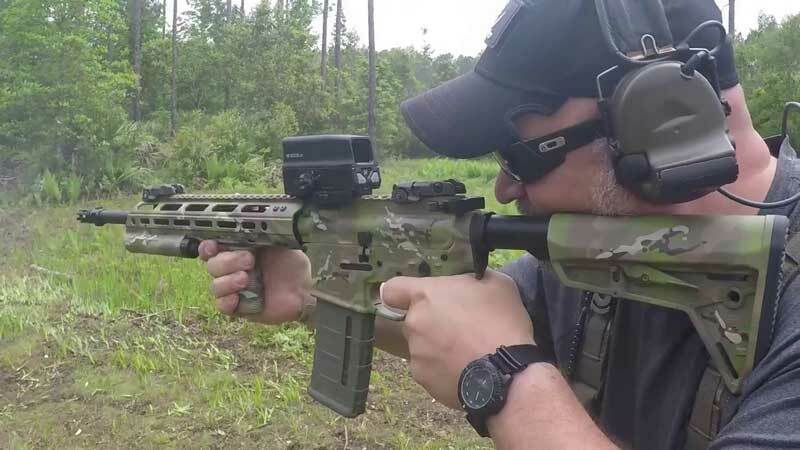 The Vortex AMG UH-1 is relatively a new model from Vortex scopes, which makes it more of an experimental model than a real high-quality option for those who like holographic systems. However, despite this seemingly innovative touch, the AMG UH-1 is indeed a model worth of your money. It is not the most expensive and not the most affordable either, yet it offers fantastic performance in almost every situation that you can get the best from. Especially in short to mid-range conditions, the ability of the AMG UH-1 to provide the perfect experience is by far unmatched by any other scope of the same brand. But it is not a scope for everyone. Not only because it is holographic or harder to use at plain daylight, but because the system needs much more care and maintenance than others – which may be annoying for most users. And at the same time, it doesn’t offer the same versatility other holographic scopes on the market do. In short, it is an affordable holographic scope for the experimental user. Not the best out there, but a relatively decent option as long as you know where it fails to deliver quality.